An opportunity awaits to own an historic hill top estate which has been restored with modern conveniences and luxurious amenities. The estate at 1353 Bridge has been beautifully restored exactly 100 years after it was built. 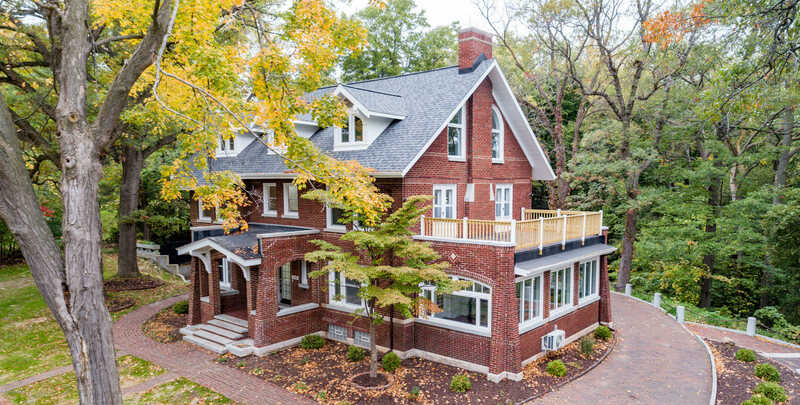 Set atop the peaceful, green rolling Stone Hills, your view of the Grand Rapids skyline and Grand River Valley are unparalled. As you walk the brick roads, winding paths, and spacious outdoor verandas you can feel the magic of this hidden urban gem. Consider the preserved paths and landmarks which reflect the design of the estate’s original owner, Mr. Frank Stone.Your new home is near the vibrant downtown, a short walk to the new Bridge Street Market, close to John Ball Zoo and only 1.5 miles from the city center. Yet the wooded slopes of Stone Hills provide you with privacy and a forest preserve setting. Directions: West on Bridge St NW to Stone Hills. Go through first tunnel and turn right, proceed to top of hill.